SAN FRANCISCO - A judge tossed out California's newly adopted lethal injection procedure on Friday, throwing the state's already stalled capital punishment system into further doubt. Marin County Superior Court Judge Faye D'Opal, finalizing a tentative ruling she issued a day earlier, said prison officials failed to properly explain why they rejected a one-drug process using only a barbiturate when one of their experts recommended it as being superior to the three-drug mixture that was adopted to execute inmates. 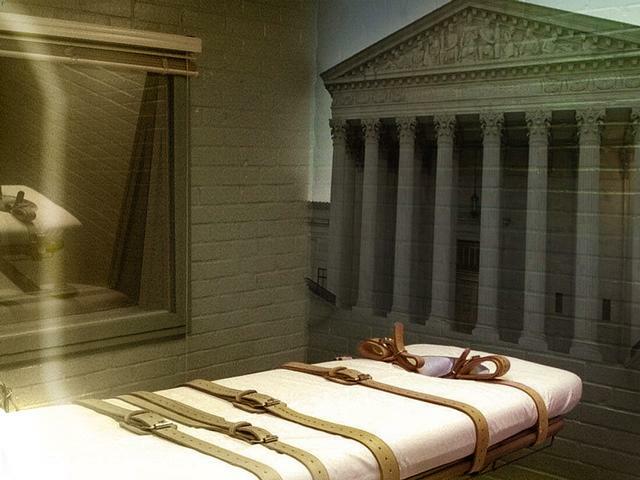 The judge wrote that critics of the three-drug lethal injection submitted comments to the department saying one of those three drugs, pancuronium bromide, "is unnecessary, dangerous, and creates a risk of excruciating pain." "Today the court struck down California's three-drug lethal injection protocol because it was enacted in violation of California law," said Sara Eisenberg, an attorney for Mitchell Sims, the condemned inmate who filed the lawsuit challenging the new, three-drug procedure. During her tentative ruling on Thursday, CBS station KPIX in San Francicso reported that D'Opal also gave California Department of Corrections and Rehabilitation's failure to disclose the costs of executions and failed to explain the reason for other procedures as part of her reasons for overturning the procedure. A call to a spokeswoman for the California Department of Corrections and Rehabilitation was not immediately returned. Prison officials will now either have to appeal or again revise their lethal injection procedures and submit them to public comment, a process that took more than a year last time. D'Opal's ruling is the second court decision barring executions in California. A federal judge imposed a de facto moratorium on executions in 2006 after finding the lethal injection process was flawed in the state. One of the state's responses to that finding was to adopt the new execution procedure, which D'Opal's ruling struck down. In her decision, D'Opal also said the Corrections Department failed to disclose the costs of executions, all of which are conducted at San Quentin Prison in Marin County. The judge noted that former San Quentin Prison Warden Jeanne Woodford said each execution costs the state between $70,000 and $200,000 in overtime for staff, crowd control, training, security and other expenses associated with carrying out lethal injections. The judge, additionally, said prison officials failed to properly notify the 720 inmates on California's death row of the new procedures. Sims filed the lawsuit challenging the new regulation last year. He was convicted of killing a 21-year-old pizza deliveryman in 1985 and had killed two other Domino's Pizza employees four days earlier in South Carolina. He's also was sentenced to die in that state. Sims filed his lawsuit on behalf of other death row inmates like him who had exhausted all their appeals and were at the head of the execution line. At least 12 inmates are in similar situations. Sims said the new regulations were improperly drafted and violated a California law requiring detailed explanations and public comments on the changes. Prison officials drafted those new regulations in response to a federal lawsuit filed by condemned inmate Michael Morales, who alleged that California's lethal injection process amounted to cruel and unusual punishment. A federal judge in 2006 ordered the Corrections Department to revamp California's entire execution process. Besides the new regulations, the department also constructed a new death chamber designed specifically for lethal injections. Prison officials previously were using the old gas chamber at San Quentin for lethal injections, which the federal judge found to be too cramped, dark and antiquated. The judge banned executions until there is a resolution in Morales' lawsuit, which is pending in San Jose. A hearing in that case was postponed until late next year while lawyers gather evidence.